After Craig Edwards and Rian Watt surveyed the current state of second and third basemen yesterday, our positional power rankings continue today with catcher. 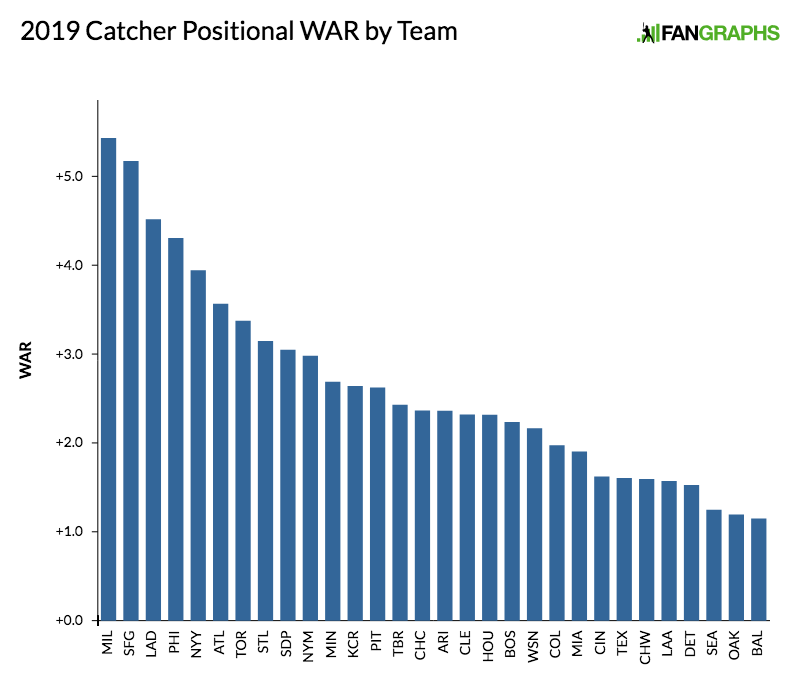 The catching position hit an 11-year low in wRC+ (84) and also dipped below 50 WAR for the first time in that same span (49.9). Just two guys topped 4.0 WAR, and neither Yasmani Grandal (4.9) nor J.T. Realmuto (4.8) reached a full 5.0 wins. Compare that to just five years ago, when five guys had at least 5.0 WAR and two of them rounded to eight wins: Yan Gomes (5.3), Rene Rivera (5.3), Russell Martin (6.5), Buster Posey (7.8), and Jonathan Lucroy (8.1). Part of the issue is that teams are much more open to splitting the duties among multiple players, which makes it tougher for even the top end to generate big numbers. In 2014, there were 23 catchers with at least 400 plate appearances, but that figure dipped to just 15 a year ago. The 2019 pool has already lost a stalwart with Salvador Perez needing Tommy John surgery, although he hasn’t topped 1.0 WAR since 2014 and has surpassed an 89 wRC+ just once in that same time frame (103 in 2017). The position is aging and hasn’t backfilled with prospects quickly enough to replace the old guard. Looking at those top performers from 2014, we see that they are all still playing but managed just a combined 6.9 (nice) WAR despite four of the five logging at least 350 plate appearances. Do not fret, though, the backfill is on the way! Danny Jansen debuted last year but will play out his rookie season in 2019. Francisco Mejia has essentially had sips of coffee each of the last two years and still holds rookie eligibility. Meanwhile, 10 other catchers made it into our Top 100 Prospects list, including three in the Top 50: Keibert Ruiz for the Dodgers (15), Sean Murphy for the Athletics (35), and Joey Bart for the Giants (41). Murphy could make a real impact in 2019 while Ruiz and Bart are long shots to arrive this year, but are slated to be factors in 2020. Will Smith, also for the Dodgers, and Andrew Knizner of the Cardinals were both given 2019 ETAs. The long-term future for catching is even brighter with William Contreras for the Braves (Willson’s brother), Ronaldo Hernandez for the Rays, Miguel Amaya for the Cubs, Daulton Varsho for the Diamondbacks, and Tyler Stephenson for the Nationals all a couple of years out. For now, we’re left wondering if Buster Posey’s hip will allow him to make a full comeback, if youngsters Gary Sanchez and Willson Contreras can get back on their pre-2018 ascent, and if Austin Barnes can deliver on 2017’s promise to carry the top end. The middle tier is filled with questions, as Arizona, Cleveland, Boston, and Colorado could see one of several options emerge as their top guy or could piecemeal an uninspiring group of 2-3 guys cobbling together 200-300 PA each. In the end, we all just want Willians Astudillo to get 400 PA somehow. We hoped you liked reading 2019 Positional Power Rankings: Catcher by Paul Sporer! Very cool Paul, thank you!